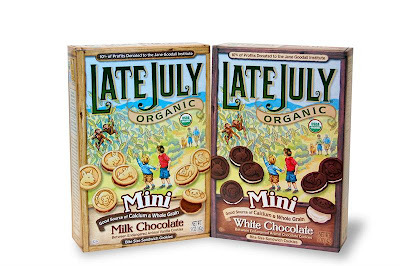 I had never heard of Late July Organic Snacks until my review and I know that now I will never forget them. Their cookies and crackers are excellent and really tasty! Their products contain organic ingredients including real organic chocolate and are a source of whole grain and calcium. Yum! Not only do they make a delicious treat, but they also are a company that is making a difference in the world. Late July has teamed up with the Jane Goodall Institute (JGI) to launch their new line of cookies and raise awareness for endangered species around the world. Each cookie features one of 7 different endangered animals that were featured in Dr. Goodall’s new book. So your child (or yourself) can get a snack and be educated about endangered species at the same time. In addition, 10% of the profits from the sale of Late July Organic Snacks goes towards JGI’s charitable efforts. Late July Organic Snacks was very generous and sent me a wide array of their product line to try. I was so excited when I opened up their package and couldn’t wait to see what they were like. The Vanilla Bean with Green Tea cookies and the Dark Chocolate cookies were amazing! I couldn’t get over the delicious flavour. I could tell that these Classic Sandwich Cookies were made with high quality ingredients just in the way they tasted. The Vanilla Bean with Green Tea Cookies were actually my favourite. I was especially curious about these since I had never tried green tea in a cookie. I would definitely get them again. The Mini Sandwich Cookies come in two flavours- Milk Chocolate and White Chocolate. The Milk Chocolate flavour is sandwiched between two vanilla cookies while the White Chocolate is between two chocolate cookies. Only one word here- Wow! They practically melt in your mouth they are just that good! The cute little animals on the top of the cookie makes them very kid friendly and are a healthier option for a treat for your child. Although the cookies were definite favourites of mine (my sweet tooth is talking here), the crackers were also really good. I tried the Cheddar Cheese Sandwich Crackers (comes in both bite size and mini) and the Organic Peanut Butter Sandwich Crackers. These two were my favourite of the crackers and were very tasty. I like that they did not have a weird aftertaste like some of the “healthy” crackers I have tried in the past. 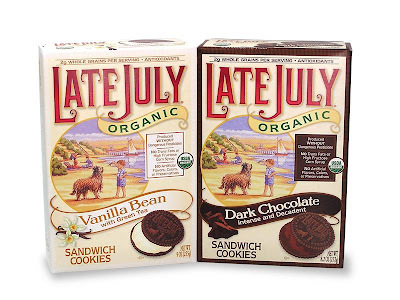 Late July is a trusted brand and I would definitely be purchasing their snacks again for my family. Late July Organic Snacks are available nationally at natural products stores, gourmet stores and supermarkets or you can purchase online from their website.